← Introverts of the world, rise up! 24°C, light wind. Clear deep blue. Duke of Edinburgh expedition, qualifying (retakes). Forty odd girls needed to re-take their expedition as a result of failing last year. Most had made a mess of navigation. All groups had most of the day to walk the 10km on low level rolling ground. Admittedly, there were tricky areas that need detailed navigation and other bits that simply need a longer steady trudge. Most groups were at camp by about 8pm. Then a distress call came over the walkie-talkie radio at about 9pm. They were lost in woods that they had searched through for hours. Chris and I decided to go find them and lead them back. Up through the zig-zag path to the ridge we went. At the top, Chris went West, I went south-east. By now, the sun was down and we were desperate to get the girls off the hill. I heard it! I could pin-point the direction it came from. The Ridge was capped with Heather and grasses, below was dense woodland. They said they were on the edge of the trees so I told them to head uphill. My head-torch was set to red flashing. “Go uphill and aim for the red flashing light”. “I can see you girls”, I called over the radio. Their whoop of delight was clearly audible without the radio. This was working. They were over 100m away but their torches were clear. “Careful and slow over the heather girls, there’s plenty of time”. Heather can be horrible, depending on what they’re wearing. Before light had completely gone, the first ones were on the ridge with me. By which time, Chris had arrived. I headed down to help the last one who was struggling with her load. One of them said, “never thought I would be so glad to see a teacher”. Big smiles with the relief. There they stood, with full packs but with shorts on this hot day. Their long, beautiful legs were criss-crossed with blood and scratches from the heather. Heather can be viscous, more when mixed with bramble. They were happy to follow my plan- follow me down, I would lead and Chris takes the rear. It must be after 10pm by now. The return was fairly easy, just take the same route back. Once in the woods though, it was obvious how dark it had become. Those girls must have been quite frightened back there. Five young women, naive and inexperienced navigators had faced the possibility of a night on the hill. I made sure lily walked behind me, but we should bunch together to pool the light. Only likely had a head-torch, the others carried hand torches that weren’t particularly bright. To the right, I noticed the sound of deer amongst the trees, sometimes a bird would fly across the pathway, surely a tawny owl. Shortly, Chris’s headlight gave up. It was the same one he used on that long night on Scafell over a week ago. Mine kept going. It probably took 40′ to get back across the river. Across the river, the last part was easy. The camp was visible from there. We took them into the staff building and sent them upstairs to wash their sore and still bleeding legs. In that time, I dug out the anti-septic cream. The night wasn’t over yet. These girls deserved some help putting up tents while we some of them cooked. All done by 12.30 and we could retire to our evening meal. Finish and debrief, we got to bed at 2am. Alarms were set for 6am. I can manage on 4 hours if it’s a one-off. Let’s hope we get no more nights like this. I will sleep deeply, my day started 18 hours ago. 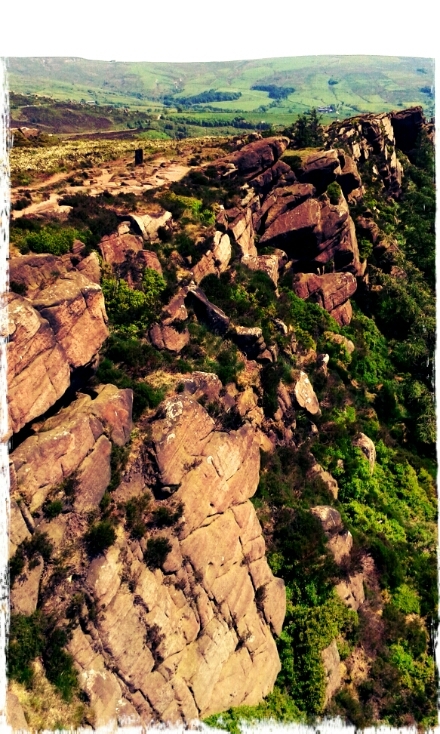 This entry was posted in DofE, Hiking, Hill & Moorland, Work and tagged bronze, DofE. Bookmark the permalink.